Make no mistake, there’s a lot involved in getting a mortgage loan. This is why Park Place Finance does the heavy lifting for you, so you can concentrate on what’s important — preparing to move into your new home. In most cases, Park Place can process home purchase closings in 2 to 3 weeks. Park Place offers loans in multiple areas and they had a website for each location, oftentimes with very similar content. Google penalizes duplicate content so, at best, they were competing with themselves — at worst, they were getting penalized. Our plan was to consolidate all of their information into one site that serves all the areas that they operate in. 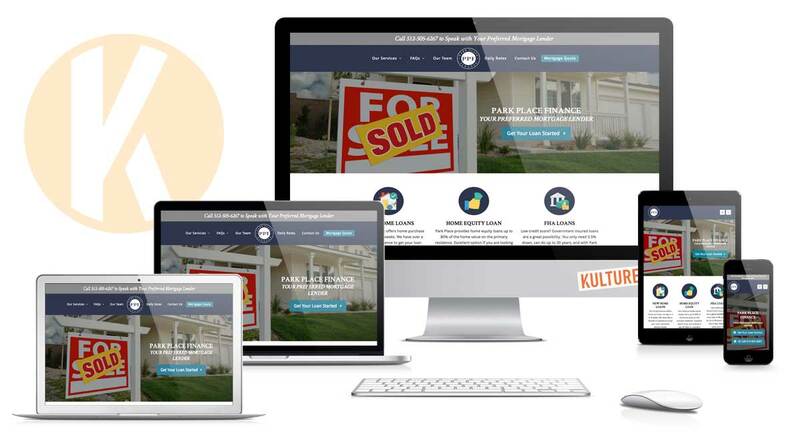 Kulture Digital designed and built a new, modern, and responsive website for Park Place that utilized flat icons and various calls-to-action. The result is a strong foundation which can be built upon with extensive landing pages for each market that they serve. Check out the Park Place Finance website.